HiBA’s purpose is to raise awareness of our collective buying behaviors, and to highlight Independent Businesses in the Heights, so that you’ll consider buying local first, and then modify your buying behavior just a tiny bit–to improve our local economy and build our community. Strong independent local businesses are the foundation for sustainable communities. 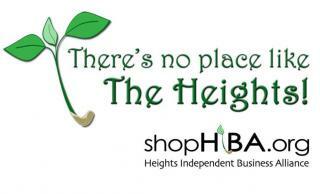 The Heights Independent Business Alliance (HiBA) works to build a vital Heights economy based on independent, locally-owned businesses. HiBA unites locally-owned independent businesses, citizens, and community organizations to support the unique culture of the Heights through public education; cooperative promotion, advertising and purchasing; creating a strong and uncompromised voice for one-of-a-kind independent businesses; and engaging citizens in guiding the future of the community.